As I've started investigating farm properties on a deeper level, I've been surprised (though, I probably shouldn't have been) to learn that there are a lot… and I mean A LOT of components that affect the value of a piece of agricultural property – for better or worse. In this blog post, I'm going to show you the full list of things I look for when I'm evaluating a piece of farm ground for purchase. Disclaimer: This list doesn't cover every possible variable, but in the many hours I've spent evaluating farm properties, I believe this touches on the majority of things that matter. Nevertheless, don't look at this as the ultimate, authoritative list. Make sure you understand the unique variables are at work in the areas where you're looking (because some of these things matter a great deal in some geographic areas, while some of them matter very little in others). What Influences the Price of Farmland? Agricultural property values can be affected by all kinds of different factors. Coming up with a solid, reliable value for a piece of farmland is anything but simple (regardless of what a seller might tell you). Sure, there are resources like AcreValue that can give you a high-level idea for what producing farms are selling for in the area, but this doesn't come close to accounting for the specific characteristics of any single property. The topography and terrain of the property. The health of the soil (salinity and alkalinity). The status of the water table and the extent of water table depletion. Fertility of land and historical crop yield. The extent of average annual rainfall. Road access and road type. The extent of urbanization surrounding the area. Facilities relating to the input and output delivery system. Banking network and credit facilities surrounding the area (if you're borrowing money to acquire the land). Influence of public and private sector, any local administrative prohibitions that affect the use of farmland. The demand for certain crops in the area (e.g. – if coffee cultivation is most favorable in a given location, and there is more demand for this type of land than there is a supply, expect the price to go up). How much the people bidding against you are willing to spend. How much similar farmland properties are selling for in the immediate vicinity. 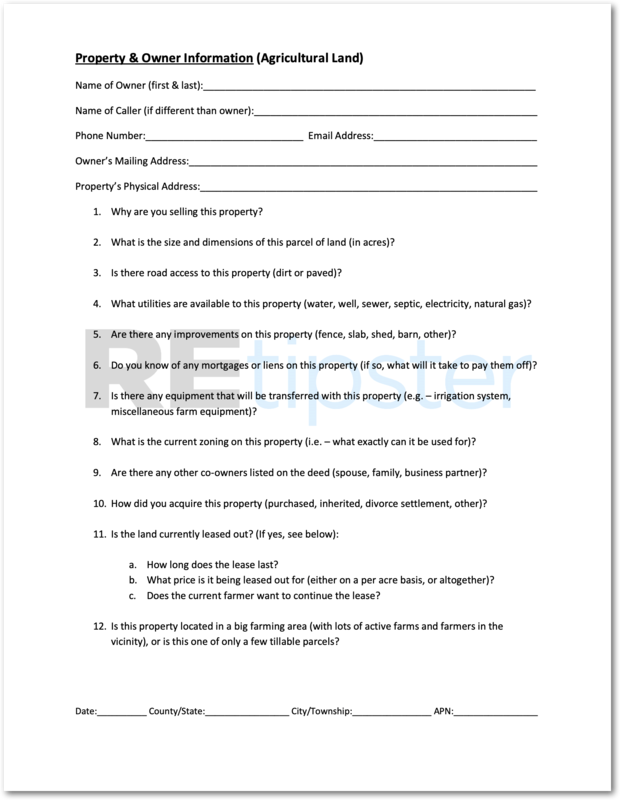 How much is the property currently leased for per acre (and when does the lease expire)? If the current farmer stops leasing the land, how much demand is there from other farmers in the area? Whether or not the land is irrigated in any way (irrigated land is typically worth far more than non-irrigated land). Any improvements to the property (barns, storage, equipment, fences, etc). Surrounding forest coverage (if any). What kind of trees, how dense and how mature? Can any of this land be developed into tillable ground? If so, how much would it cost per acre to do this? As you can see, there's a lot of information you'll need to consider in order to make a good decision. As with any type of real estate, most of this data can be collected online, but some of it will require some kind of phone call or in-person visit, usually with the current landowner and with some local sources of information (like the county office, local lenders, other farmers, etc). How much is the land currently leased for per acre? I would want to verify this by asking the current owner and usually seeing a copy of the lease to evidence what the agreed annual rent amount is. Does the current lessee farmer want to continue the lease? If not, how many other farmers in the area would be interested? In most farming communities, a good piece of farmland will always be in demand. Even if the current farmer doesn't want to continue the lease, it won't be hard to find more farmers lined up behind them who will be glad to lease it (assuming the price stays in line with the market). In any event, this situation can be verified by talking with the current lessee and/or calling around the local farming community to gauge what level of interest there is for this type of property. How large is the surrounding farm community (how many farmers or active farmland parcels in the area)? This can be observed fairly easily by looking for obvious tillable land on Google Earth and/or by following the same steps as the previous bullet point, and making some phone calls to local farming organizations in the area to determine how much farming activity there currently is. Is the land irrigated in any way? If so, what are the sources of irrigation and infrastructure? This can be answered fairly easily by asking the landowner. Most irrigated farms will be worth significantly more than farmland that isn't irrigated (because it significantly decreases the risk of a failed crop due to drought or lack of rainfall). Are there any improvements to the property (barns, houses, storage, equipment, etc)? Outside of asking the current landowner, these improvements can usually be seen on Google Earth and will be made even more obvious if/when you choose to order a survey during the closing process (which I would strongly recommend for a large investment like farmland). What crops have been in rotation on this property, and in what intervals? This can be verified by talking to the landowner, but an even better source of information would be the current farmer who is working the land. If you're not familiar with the importance of crop rotation, check out this article. 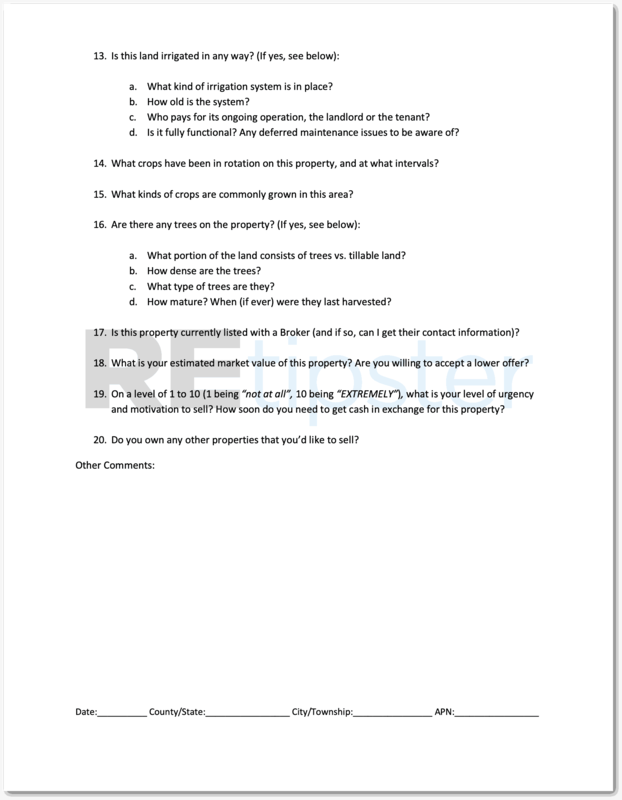 Now, I'm not saying my property research checklist if the end-all be-all, but so far, it's been a pretty helpful resource to make sure I don't forget any important points as I'm talking with the landowner about their property. Want To Use My Checklist? 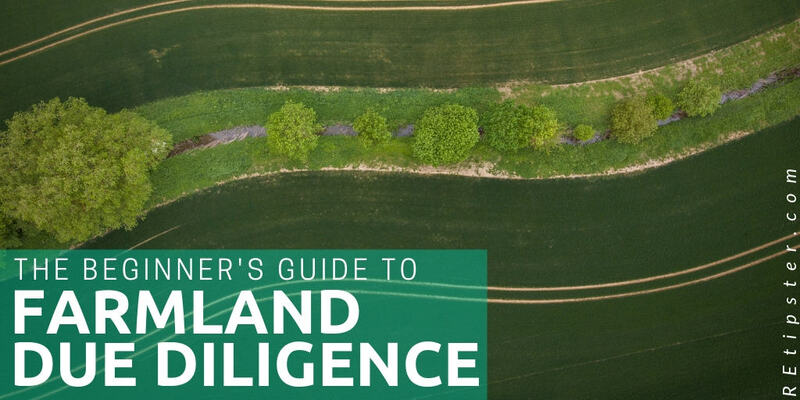 When I first started learning about farmland (and how VASTLY different it is from any other type of real estate), it took a fair amount of trial and error to figure out which questions I needed to ask and what information truly made a difference as I researched each potential investment decision. Even if you're coming from the world of investing in vacant residential lots, you'll find that agricultural land is significantly different. If you need a quick reference guide to help you ask the important questions, if you sign up as an REtipster Email Subscriber below, you'll see a free download button where you can get a copy of this pdf for free. I hope it helps! 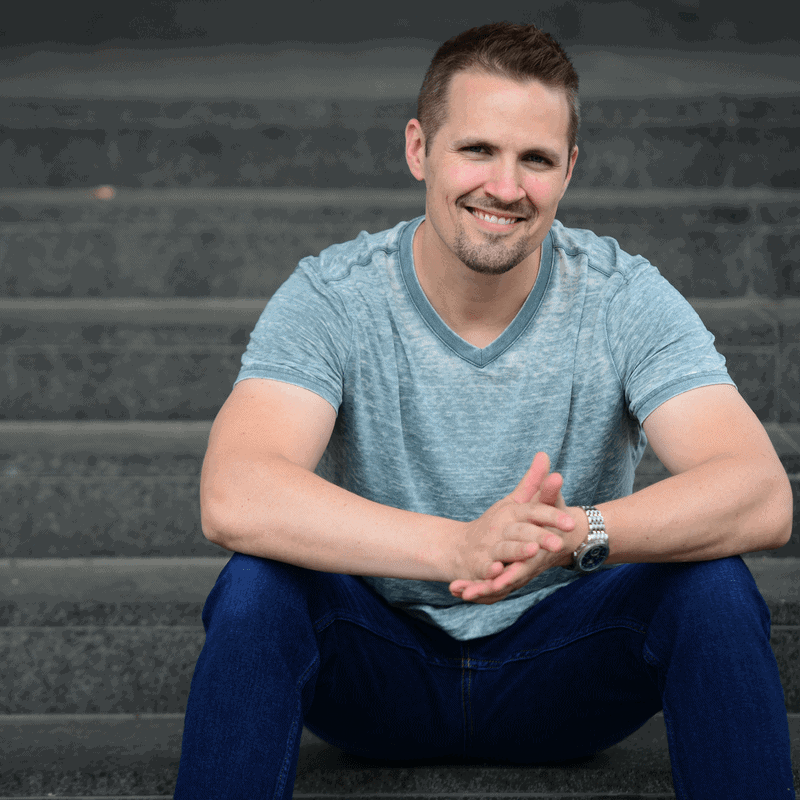 Also keep in mind – if you want to fully automate your “information-gathering” process, be sure to check out my detailed blog post on How to Create a Buying Website (you might be surprised – it's easier than you'd think). Best of luck! Windfarm 101: Is Your Land Ideal for a Wind Turbine? Great article as always Seth! Being part of a family that owns quite a bit of farmland I woyld add that there are two very important things for every farm; The soil survey and the condition of drainage works such as terraces, tiling, and dry dams. The soil will give a clear indication of value in many parts of the usa, and the lack of proper tiling etc can be a costly investment to install. I would imagine the farmer leasing the land would be a good source for an honest opinion about these. Those are great additions Jason – thanks for chiming in! I’ll have to add those to the list.